Expected to ship on or about 05/12/19. Discover a series of seasons which will help you journey from the elusive balanced life to the ebb and flow of God's rhythm. From pastor to backslider to reclaimed saint, Frank Maycock has encountered the way to live the abundant life through aligning yourself with the purposes of the Lord. FRANK MAYCOCK is a certified personal and executive coach and creator/owner of Kinetos Coaching. His love and passion in life has been to help people discover the greatness within themselves and the ability to see the power of God. Born in Los Angeles, California. Frank did his undergraduate work in 1973 at Biola University. In 1986, he completed a Master's of Divinity from Fuller Theological Seminary in Pasadena, CA. with a concentration in Marriage and Family ministries. In 2006, he earned his Doctor of Ministry degree from Columbia Theological Seminary with a concentration in Christian Spirituality. He has been married to his lovely wife Cindy for over 34 years and has two children, a daughter-in-law, and a grandson. 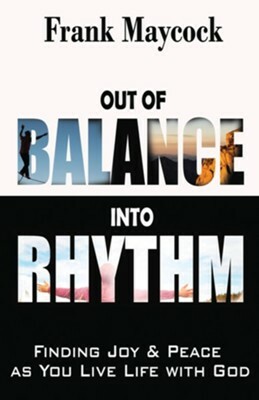 I'm the author/artist and I want to review Out of Balance Into Rhythm: Finding Joy and Peace As You Live Life With God.